Good for hiking and casual outings, the Evenflo Infant Soft Baby Carrier gives you the freedom to conquer your day without the need of a stroller. Position your child facing inward for close personal interactions or to provide a secluded hideaway. When facing outward, the rear collar folds down to form an easy-to-clean creamsicle bib that allows your baby's smile to shine. Fashioned with soft and resilient fabrics, it provides a comfortable and hands-free way to meet your essential travel needs. The baby chest carrier is machine washable for easy cleaning. 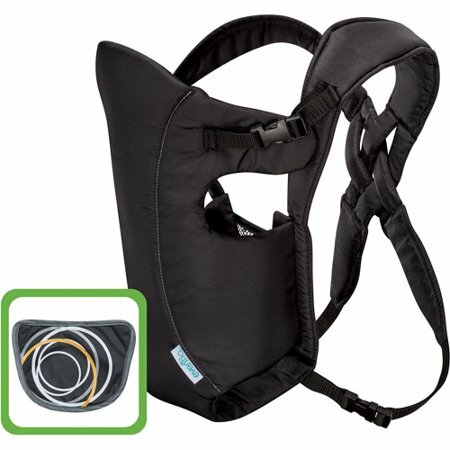 Love this carrier it beats takin out a stroller for a quick run just pop baby in and keep it Rollin !!!! Great for doing chores w/o holding your baby in your hands. The carrier does as advertised. It carries the baby. It is a little uncomfortable for me to wear, but is better than not being able to get stuff done due to my baby needing to be close. If a woman were still heavy in the stomach, or still having trouble with back pain from labor, this is not the product for them. Note that it has warnings about the leg hole and tells you to make sure that you tighten them as neded to snugly fit the infant, but they are not adjustable. Also, if you are really skinny and have a small baby, the straps might not tighten enough for you, however, for $13, I call it a bargain. Great deal. I use just on a few occasions...sometimes my back gets tired; but it is still a great item to have for events like corn mazes and crowded areas where strollers are not convenient. My son is 19 pounds and it fits okay. I only use it when I need both hands free. I will be trying it outside when the weather gets better, but for now it's just around the home use. I will say it does hurt your shoulders after a while using it. The weight limit is up to 26 pounds so it will do for now. Yes, i am a large person. This BARELY fits me in order to even put my daughter IN it. We have to add nylon straps and buckles in order to use this comfortably for my daughter and me. It is an excellent price but was not secure enough against my body. My baby bounced far too much even when all of the straps were tightly secured. I returned it after a week.